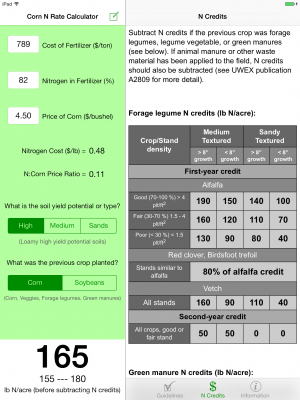 The Corn N Rate app calculates a nitrogen fertilizer rate for your field using University of Wisconsin recommendations designed to assist Wisconsin producers in selecting an N rate that improves profitability when N and corn prices fluctuate. Maximum return to N (MRTN) is the N rate that will be most profitable for a particular N:Corn ratio. 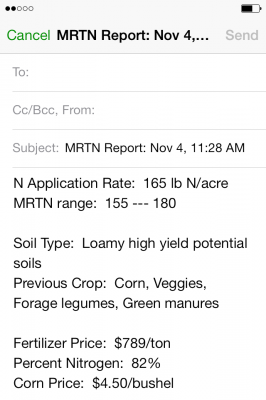 The MRTN rate is the LARGE number expressed in lbs N/acre (total to apply) including N in starter. Below that number is the range of N rates that result in profitability within $1/acre of the MRTN rate. numbers. This app will add the decimal point automatically for the Corn Price. To enter $5.00 for corn, simply type 500 or just 5. If you want to enter $10.00, simply type 1000 or 10. There is a special way to enter a price below $1.99; you simply type a “0” first, then the price. To enter $1.50, you type 0150. 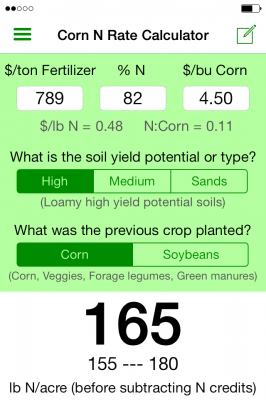 Tap a button to choose your soil yield potential or soil type. And tap a button for previous crop or irrigation. Your fields MRTN rate will be displyed in lds N/acre (total to apply), as well as the MRTN rate range. Look at the “N Credits” and “Guidelines” screens for important adjustments to the MRTN rate. E-mail your report to save or share your Wisconsin Corn N Rate information. To determine soil yield potential, consult UWEX publication A2809 or contact your county agent or agronomist.